Hunter Spanjer's parents say officials at his Nebraska school asked them to change the sign for Hunter's name, saying it looked too "gun-like," but the school is denying they ever made the request. NBC's Ron Allen reports and the Spanjer family talks about what the principal told them. Updated at 12:15 a.m. Wednesday ET: Deaf 3-year-old Hunter Spanjer of Nebraska signs his first name with a gesture resembling a gun, and his parents say his school wants him to stop. School officials say they haven't asked any deaf students to change how they sign their names. The preschooler's father, Brian Spanjer, took to Facebook Sunday to garner support to allow his son to continue using the S.E.E. (Signing Exact English) symbol at the Early Learning Center he began attending last week. 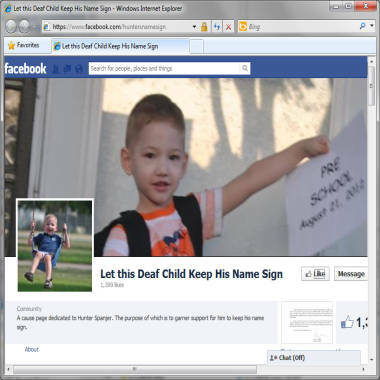 The Facebook page, "Let this Deaf Child Keep His Name Sign," had more than 5,300 likes by early Wednesday. Hunter has used the name sign since he was 6 months old, when the school district started working with him, Janet Logue, Hunter's grandmother, told NBC News. The name combines the symbol for the letter h for hunt, the thumb down along index and middle fingers extended together and waved, with the letter r, crossing the two fingers, Logue explained. “Hunter is kinda confused” at school now, where teachers are spelling his name out to him, Logue said. Spanjer posted a letter from the American Civil Liberties Union, which Hunter’s grandmother, Janet Logue, described in a comment as the civil rights organization citing legal cases and telling the Grand Island Public Schools it’s wrong and "politely asking them to rethink their position." "My son broke down in tears, overwhelmed by the support he’s getting,"Logue said of the boy's father. Brian Spanjer told NBC News he has vowed to fight until his son gets to keep his name sign. The name Hunter evolved from Brian Spanjer being a fan of outlaw music and admiring singer Waylon Jennings' son is named Shooter. Suggesting that name to the boy's mother, Morgan Hurt, when she was pregnant didn't go over well, Spanjer told NBC News. However, she found "Hunter" in a name book and offered it as a compromise and it stuck, he said. Spanjer said he's shielding Hunter from the attention his dispute with the school district is generating. "I am shocked this is an issue," he said. "As a parent you never think anyone would take issue with your child's name," he said. "When someone is named Christian, people don’t automatically go to religion," he said. "I want to make sure this doesn’t happen to any other deaf child or special needs child," he said. The policy of Grand Island schools, about 145 miles west of Omaha, forbids students "to knowingly and voluntarily possess, handle, transmit or use any instrument in school, on school grounds or at school functions that is a firearm, weapon, or looks like a weapon…"
Because of privacy rules a school spokesman could not directly address the Spanjers' complaint. "Grand Island Public Schools has not changed the sign language name of any student, nor is it requiring any student to change how his or her name is signed," district spokesman Jack Sheard said in a prepared statement. "The school district teaches American Sign Language ("ASL") for students with hearing impairments. ASL is recommended by the Nebraska Department of Education and is widely used in the United States. The sign language techniques taught in the school district are consistent with the standards of the Nebraska Department of Education and ASL. ... Our mission remains: Every Student, Every Day, a Success!" "It’s unfortunate we’re getting a black eye for something when we’re really dedicated to that goal," Sheard told NBC News. Brian Spanjer said he doesn't have any issue with Hunter learning ASL too, but he hopes to have an S.E.E. interpreter for his son. He said he prefers S.E.E. 's exact language approach to signing over ASL's.